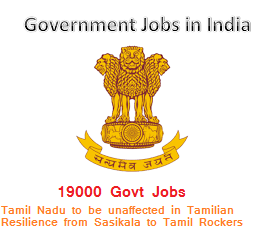 23000 Govt Jobs in Tamil Nadu for Police Constable, Nurse, Engineer, Railway, Asst, Technician, etc. Job seekers of Tamil Nadu may be messed up with the ongoing political scenario of the state. Tiff between two CM candidates may have held back the government job recruitment process to far extent, but Tamil Nadu seems unaffected in these circumstances. Job seekers of Tamil Nadu may be messed up with the ongoing political scenario of the state. Tiff between two CM candidates may have held back the government job recruitment process to far extent, but Tamil Nadu seems unaffected in these circumstances. Around 23000 government jobs are still active for aspiring candidates to apply soon. Tamil Nadu is presently juggling in between two CM candidates after J. Jayalalitha’s demise. Tamil Nadu Governor Vidyasagar Rao will end up this political instability on 10 February 2017 and choose between O Panneerselvam and VK Sasikala as the next chief minister of the state. The state may be out from this situation soon, but the other problem that Tamil film industry is facing right now is from Tamil Rockers, a Torrent website who threatened to live stream, the yet to be released Si 3 movie, the third installment of Singam franchise. The state is sailing in the state of confusion, instability and threat from all the variations of society, but still the government job sector is going strong with its availability of present jobs and upcoming new vacancies from different reputed organizations. Some major vacancies are enlisted below for job searching candidates to apply without fail. The major vacancy that Tamil Nadu presently has is to recruit 15705 constable, jail warder and fireman jobs. The aspiring candidates have time to apply for this job before 22 February. Starting from matriculation degree to graduates, anyone can apply for this notification. The other job notification having 2804 vacancies to fill up Auxiliary Nurse Midwife Posts is from Medical Services Recruitment Board Tamil Nadu. The last date for this job post is till 24 February. Aspiring candidates can apply for 477 Assistant Engineers and other posts under Chennai Metro Water on or before 06 March this year. Take a look at the links given below for more information about job posts.